6 Hours on a train. I’m sat on a train going to Srikakulam. I’m on the Howrah Mail to be precise, which has been travelling since yesterday sometime and it is proving to be a very acceptable mode of transport. I love journeys and I love train journeys especially. I think it is the excitement in part of going somewhere new. Rushing by are the wet rice paddies, countless Palm and Coconut trees and well, life. I’m sat in the compartment with two Indian gentlemen. One is quite chatty, the other, not so. Maybe it’s the language barrier. This is a Telugu speaking area and some speak English and others do not. I guess it’s easy for us English speaking folk. We never have to worry much about language, wherever we go in the world. The quiet chap opposite, wearing a rather loud purple, green and blue striped shirt that would be hard to ignore anywhere, is really tucking into his food which is making things worse. 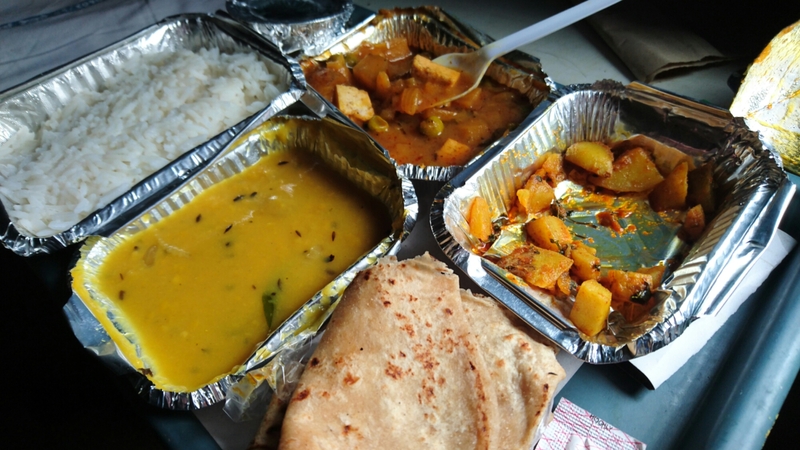 But at just the right time, the Indian Railways food guy turns up. However, I’m trying to order lunch without much success as the Indian Railways food guy speaks zero English. Not good, because I speak virtually zero Telugu. Luckily for me, talkative guy rouses from his slumber in the bunk above me and comes to my aid. Now surprisingly, quiet guy sat opposite also gets involved helpfully confirming what time I will be getting down from the train for Srikakulam. After several exchanges between the four of us, I think I’ve ordered a vegetable curry with rice and roti. Well, we shall see what arrives. My journey through South India has been quite a ride. It began its life at Hyderabad which was a good starting point. 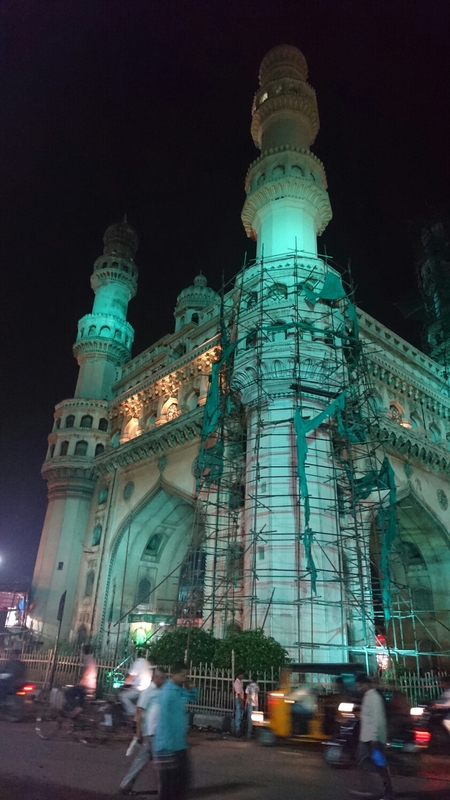 There was nothing bad about Hyderabad , only good. Hyderabad is a vast seething metropolis of more than eight million souls. It’s quite a sight as you gaze out over endless urban conurbation stretching as far as the eye can see. The landscape outside my train window has already started to alter. Rice paddies have all but disappeared, replaced with fields, trees and hills in the distance. Palm fruit trees and swathes of coconut trees still regularly appear. Quiet guy opposite is now in a prone position, sleeping and snoring contentedly after his lunch, whilst I am now struggling to concentrate because of that very same noise. A young man from the Indian Railways turns up and sprays the carriage floor with a curious yellow liquid and proceeds to mop. Disinfectant I guess. Our compartment smells sweeter and fresher momentarily. The train crosses a dry river bed, save for a small water course nestling in the bottom. There is something quintessentially Indian about trains crossing river beds. The rhythmic clang and clatter reverberating around the iron framework as the in-numerous carriages roll at speed across the span of the river bed below. Meanwhile a stand of banana trees pass by outside and yet another Indian Railways official turns up checking on the cleanliness of the carriage. I have to sign a form, give my ticket number and seat reservation. He disappears but then quickly reappears to question something about the phone number I have just given him. I can’t completely understand what he’s going on about but talkative guy above me comes to my rescue again and basically tells him to stop bothering me. He goes again. Numerous food and drink wallahs continue to ply their trade and I really want to try the tomato soup and croutons but I am nervous. I’ve learnt that food and drink can be drugged and once you’re unconscious, they come back and rob you. Not wanting to wake up in just my underpants with all my worldly possessions gone, I decide to resist. We’ve crossed another bridge, and down below on the river bank, the Dhobi wallahs are hard at work washing what looks like bed sheets or saris and laying them out to dry in the sun. That looks like a nice job. More impressive hills are gliding past us outside, amid the serene and beautiful landscape. Verdant and lush vegetation dominate, and being monsoon season, a cool, grey gloom pervades. In fact it looks a bit too gloomy but that is part and parcel of this time of year. I have been to India many times and I wouldn’t normally choose to come in July, but I have been invited to a wedding and so here I am. Great reason to break the habit of a lifetime. Some of the other train passengers are chatting amongst themselves, in what I presume is Telugu but it could also be Tamil as this train began its slow trek north in the City of Chennai, on the Coromandel Coast. I’m feeling really hungry now and kind of wanting the tomato soup wallah to reappear or at least the vegetable curry I ordered earlier. Quiet guy is now snoring loudly. A quick shower of rain appears outside but ends as quickly as it began. We cross yet another river bridge, an old rusty one by the looks of it. Palm fruit trees stand sentinel over the fields below. We’re in the middle of nowhere but the train is slowing to a stop, which can mean anything in this part of the world: waiting for a another train to cross, a breakdown or who knows what. A woman in another part of the carriage is talking to a small group and every now and again, laughter erupts. Right on cue vegetable curry man appears with my lunch. The tray is laid on the table and I am somewhat taken aback by amount of food served in neat little foil trays with lids: rice, roti, two types of curried vegetables one with paneer, some dhal plus the mandatory raita to cool the palate. Talkative man now climbs down from the top bunk also to partake of lunch. He introduces himself as Ravi Chakrabatti from Kolkata, and we laugh about quiet man snoring soundly across the way. Ravi laughs and says it doesn’t matter what time of day it is, this guy manages to sleep and snore all the time. He chuckles again declaring that any time of the day is the same for this chap, concluding somewhat hysterically that “maximum snoring is there!” Ravi got on the train at 6.30 this morning and quiet man was snoring even more loudly then. While we are laughing and chatting, the train has recommenced its journey again and now rolls slowly into the Andhra Pradesh railhead of Visakhapatnam. Ravi tells me that he is an assistant manager for an automotive lubricant company and he is returning home to Kolkata, which is the final terminus of this Howrah Mail. Meanwhile, quiet man has now woken up and is joining in the conversation. He is a children’s clothing wholesaler from Nellore and is on the way to Kolkata to buy clothing to sell on and distribute from his warehouse in the South. The Howrah Mail, which is never late according to Ravi, tracks north now towards her destination. The horizon is filled with even more impressive hills now creating a more dramatic backdrop and we cross another river passing yet more dhobi wallahs working hard under the hot Indian sun. Quiet man helpfully informs me that my station will be approaching in about thirty minutes. I will be sad to get off this train as this has to rank as one of the most enjoyable rail journeys I have taken – and I have travelled a lot by rail in India over the last twenty-one years. 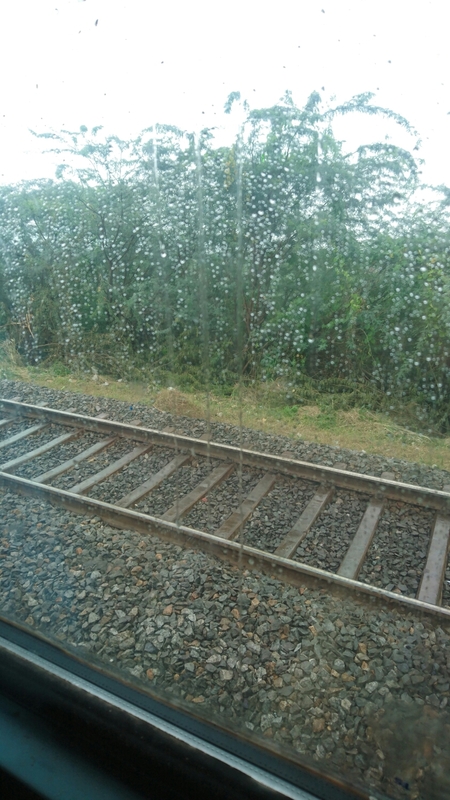 As the train finally draws near Srikakulam, rain-laden monsoon clouds tower above the cooler hills and hot plains below. Time for one more iron railway bridge before we arrive, arching over yet another wide and ponderous river beneath. The reassuring clatter of metal against metal is heard as several hundred tons of rolling stock lumber across, moving inexorably towards solid ground once again. Posted on Jul 28, 2016 Sep 28, 2016 by John RabyPosted in Blog, India, TravelTagged Chai Wallah, Chennai, Coconuts Rice, Food, Howrah, Hyderabad, India, Trains, Visakhapatnam. Previous Previous post: It’s all a matter of perspective. Next Next post: Espresso Seafood Bar and Grill.